The high quality Paper Pulp Refining Discs are widely used in the paper processing industry. Available in various sizes so as to fit different machinery, these Paper Pulp Refining Discs are known for their strength and impeccable designing. 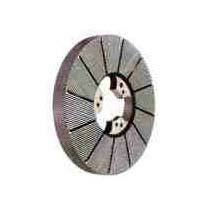 Extensively used in the machines aiding the industrial production of recycled paper and paper processing, the Paper Pulp Dispersing Discs are widely demanded across the global markets.